What's it like to be only a Junior and be one of the best XC runners in the State, maybe even the Nation? What's it feel like to win the State XC Meet? What does running mean to you and bring to your life? HL: What were your goals for the State Meet? RG: I wanted to keep the pressure on myself to a minimum. After last year's State, when I had high expectations but didn't fulfill them (Ed. she was 13th in D2), I realized I had put too much pressure on myself. I wanted it to be different this year. I wanted to run my race, and in the back of my mind, I wanted to win. HL: Tell me about this year's State race. RG: Before the race went off, I realized this is it - State Meet, something I'd been training for since last year's State Meet. I feel I'm a much better XC runner than Track, so State was my main focus. I also had to remind myself that this is just a race so RELAX. The first mile I wanted to run just smooth and relaxed and was hoping that it wouldn't go out too fast or someone wouldn't jump out to a quick lead, and this is just what happened. It was quick but easy, and we were all running in a pack so I could see where everyone was. Just after the mile, where I didn't see the time (Ed. 5:37), I did a push on the little uphill to move to the front of the pack. My coach (Ed. Ernie Lee) said not to worry about the time, just to focus on how I felt and the race around me. Half a mile later, on the downhill, is where I wanted to really work the pace, so I pushed the downhill but could still hear people behind me. It wasn't until I worked the uphill, just before two miles, that I quit hearing anyone and I was feeling good. The whole last mile I thought I was slowing down, and I didn't want to start hearing anyone again, so I basically did a one mile surge. With a half mile to go, I knew if anyone was to work that hard to catch me that I could out kick her at the end. This is when I thought I might win State. The race was over so quickly - I don't really remember any pain at all. 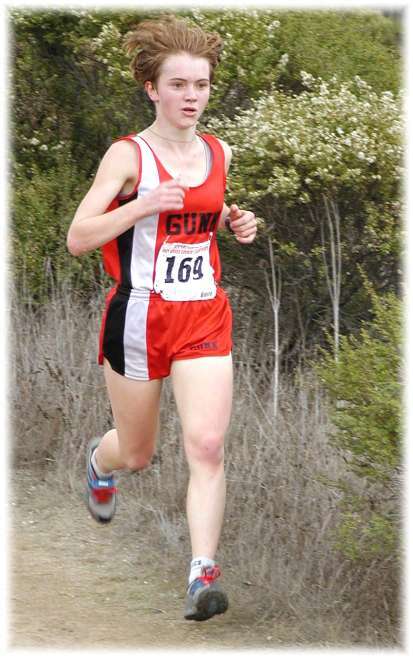 My coach says I'm the first State Champion for Gunn HS in any sport - wow! HL: What are your goals now? RG: Top 8 at Footlocker- West. HL: What got you into running? RG: Besides the fact that my Dad did it… When I came to Gunn as a Freshman I was new to the school district, so I did it to meet some other kids. I knew I was a pretty good runner so that's the sport I chose. The second day of practice, Coach Daner said he thought I'd be our Top JV or possibly make Varsity, and he was right. 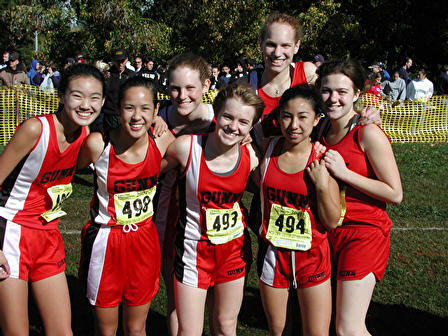 Our first meet I was 4th Varsity. HL: Why do you keep running? RG: Running is my 'Zen.' I like running because I'm good at it. I love my teammates and coaches. I feel it's romantic - running with nature and it's "pureness". Getting to the top of the hill at Rancho and being able to look out at the entire Bay Area… I'm addicted to running. When I was injured at the beginning of track last year and couldn't run - I hated it. With all the insecurities teens have, I find running the one thing that gives me confidence. HL: Is there anything you'd like to say that I didn't cover? RG: I would have liked it to rain DURING our race at State, like the D2 boys - now that is real Cross-Country.